Three drought-tolerant maize hybrids performing well in drought-prone areas and tolerant of Malawi’s major maize diseases have been released in Malawi. The new hybrids, said a member of the Agricultural Technology Clearing Committee, will contribute to the subsidy program that has seen Malawi become self-sufficient in maize production and even export surplus maize to neighboring countries. They will also be important in mitigating climate change. “Maize accounts for over 70% of cereal production,” maize commodity team leader Kesbelll Kaonga explained the importance of maize for the country, adding that Malawians consume on average about 300 kg per year. Conservation agriculture: The Green Revolution for Africa? The Global Conservation Agriculture Program (GCAP) works closely with partners all over the world toward an ultimate vision of widespread use of sustainable systems by smallholder farmers, based on the principles of conservation agriculture (CA). Our key partner in Africa is the African Conservation Tillage Network (ACT). We asked their Executive Secretary, Saidi Mkomwa, about the current status and future of CA in Africa. ACT was established in 1998. Has Africa seen a big change in CA adoption since then? Mkomwa: The adoption rate isn’t very big, but we think it’s good. It took Brazil 17 years to get the first one million hectares under CA; it’s been a shorter time in Africa and we have almost reached one million hectares already. It is happening at a slower rate than we would want, but it’s getting there. We have seen partial adoption of CA principles across the continent. For example, during one of our exchange visits to Zambia, we met a woman – we nicknamed her Barefoot Woman – who had no shoes but she was rich and she was proud to be a farmer. She wasn’t practicing all three principles, only reduced tillage combined with some mechanization, but it’s a start. Why do you think that CA is key in improving food security in Africa? Mkomwa: The Green Revolution that has been so helpful in Asia has passed by and Africa has not benefited from it. We think it’s primarily because of the continent’s poor infrastructure: getting fertilizers to people is a problem because transportation is difficult; farmers don’t have cash and there are no banks to borrow from. But even when farmers can efficiently utilize fertilizers and improved seeds, their work is hampered by degraded soil, inadequate soil moisture, and inadequate access to water. For Africa to benefit, the soil has to improve. We believe that the Green Revolution in Africa has to start with smallholder rainfed farmers and CA is a possible intervention, more affordable than, for example, building irrigation schemes. We have been promoting CA a lot by looking at the yields. A lot of people will ask how much the yield increase is. I’ll say that we should also be looking at the annual productivity of the land, annual productivity of labor. You can have a modest yield of 3 tons per hectare, but if you can have two crops in there instead of one, we’re looking at 6 tons per hectare per year in the end. This is affordable intensification. And it’s not only that: CA also increases the soil moisture retention, thus increasing annual productivity of the land and – through the use of crop residues – decreasing the dependency on external inputs, such as fertilizers, which farmers fail to acquire. What are the biggest challenges you’re facing in your work? Mkomwa: One is that people don’t know about CA. We organize a lot of awareness creation activities, from conferences to exchange visits. What makes this worse, though, is that many of our colleges are still training their graduates to work in conventional systems. We are telling people not to plough and the professors are training the next generation of extension staff to plough. We have established a community of practice of researchers and academia through which we try to sensitize the professors themselves so that they can change their curricula. Changing people’s mindset is another challenge. They have been farming a certain way all their lives and, all of a sudden, we come and tell them to do something different. However, the challenges differ depending on the farming system and farmers’ resources. You cannot be prescriptive; you have to work with the farmers to create a solution relevant to them. In an agropastoralist system, you have to integrate livestock, although we have seen promoters of CA seeing livestock as a threat. In reality, livestock integration benefits the farming system; it can increase the value of our cereals: instead of taking grains to the market, you take milk or eggs. In West Africa, you literally can’t talk about leaving crop residues on the field as soil cover. People will think you’re crazy, since some of the crop residues have a higher value as livestock feed. Again, you have to look into alternatives, such as shrubs and trees. Are there any downsides to CA? Mkomwa: So far we have not encountered any. CA should create a win-win-win situation: provide more food for farmers, reverse environmental degradation, and arrest climate change for future generations. Does the climate change argument help convince African farmers to adopt CA? Mkomwa: It is one of the biggest promoters of CA. Farmers practicing CA have proven to their neighbors that they’re able to get some crop when conventional agriculture gets zero. Then we don’t need to say anything. The resilience of CA fields is much higher. The message is straightforward. If I was an African smallholder farmer, how would you convince me to adopt CA? Mkomwa: You’ve been farming for the last 40 years, can you tell me how far has this farming taken you? The reflection on how conventional farming has managed to feed farmers’ families is important: it has failed to feed them and they have to look at alternatives. And we’re offering one. But if you’re an African farmer, we should take you to your nearest neighbor who is doing well so that you can talk to them. If we talk to you as scientists or development workers, you might think we’re adding salt to the benefits. That’s the challenge we’re facing: having enough model farmers. How is CIMMYT helping your work? Mkomwa: CIMMYT is an important partner in capacity building and research. We don’t have a research system in place and GCAP is thus a great asset to our work. CIMMYT is also leading the ‘Farm power and conservation agriculture for sustainable intensification’ (FACASI) project. We are part of this project and as we see mechanization as one of the bottlenecks hindering CA adoption in Africa, it is a very valuable partnership. Furthermore, we are jointly organizing – with CIMMYT, FAO, and NEPAD – the upcoming Africa Congress on Conservation Agriculture (18-21 March 2014, Lusaka, Zambia). With farmers at the center of the Congress, we hope to hear about their problems and progress. We need them to move forward as we believe that an increase in CA adoption would have a great impact on food security on both national and continental level. 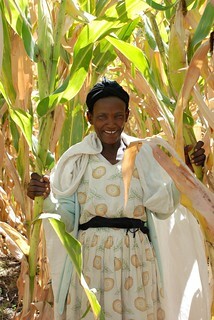 The Nutritious Maize for Ethiopia (NuME) aims to develop and promote quality protein maize (QPM) in the major maize growing areas of Ethiopia, including the highlands and the dry lands, to improve nutritional status of children. The project has a strong gender component, ensuring women’s full participation in all activities and equal share of benefits, which was discussed during a Gender Analysis and Strategy workshop at the ILRI campus in Addis Ababa, Ethiopia, on 16 April 2013. The purpose of the event was to present gender analysis and gender strategy developed by Kidist Gebreselasie, NuME gender consultant, to implementation partners, receive partners’ input, agree on strategy, and discuss future developments. 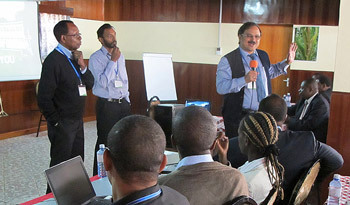 The workshop was attended by representatives from the Ethiopian Institute of Agricultural Research (EIAR), ministries of health and agriculture, the Ethiopian Health and Nutrition Research Institute (EHNRI), SG2000, FRI, the Ethiopian Seed Enterprise, other seed companies, Hawassa University, Harvard Institute of Public Health, and CIDA (the project’s funder). CIMMYT was represented by Dagne Wegary (interim project coordinator), Dennis Friesen (project advisor/consultant), Vongai Kandiwa (gender specialist), and Hugo De Groote (agricultural economist). In the opening session of the workshop, Gebreselasie presented her synthesis developed in collaboration with CIMMYT scientists and based on literature review, analysis of a baseline survey (both men and women were interviewed), and an indepth study of two target areas (including focus group discussions and key informant interviews). Gebreselasie found that while men are responsible for plowing and purchase of inputs, including seed, women are responsible for household chores such as cooking and child care. However, both men and women contribute to harvesting and weeding. Planting is either a shared activity, or one done by men. Children are also involved in agricultural activities as they play an important role in herding animals and providing feed and water. Dairy and poultry production management is largely a women’s responsibility; although women receive a substantial part of the income resulting from these activities, their access to resources, as compared to men’s, is largely limited, particularly when it comes to extension services. The agricultural extension system focuses on men and female-headed households; wives are expected to learn from their husbands. Women are also rarely invited to agricultural trainings, especially when they take place outside of their own farm. It is much easier for women to access health extension than agricultural extension workers. Gebreselasie then outlined a gender strategy to address the above listed constraints and to improve women’s participation in project activities. This involves increasing women’s attendance at QPM demonstrations by inviting them directly and by organizing separate sessions for women during field days, ensuring that the time and place is convenient for them. Gebreselasie suggested involvement of health extension workers in QPM promotion and higher level of women’s involvement in farm radio activities (targeting women). Furthermore, partners should be given incentives to involve women more, and they should also be provided gender training at all levels. After the presentation, the workshop participants reviewed their organizations’ experiences in gender activities and their responses to the analysis, and discussed ways to incorporate the strategy in their activities. The NuME gender strategy was later presented and discussed during a meeting of the Project Steering Committee on 23 May at ILRI. CIDA representative Stefna Pacquette emphasized that the strategy needs to involve women in a meaningful way beyond simple participation in project activities. “While focusing on nutrition, NuME can provide a vehicle for strengthening women’s role in the household,” Pacquette noted. “It can also get men to feel more comfortable with women’s presence and participation in traditional male roles.” The next necessary step for NuME is the recruitment of a gender specialist to aid implementation of the strategy. “I can now identify with accuracy plants affected with maize lethal necrotic disease,” stated Regina Tende, PhD student attached to CIMMYT, after attending the CIMMYT-Kenya Agricultural Research Institute (KARI) “Identification and Management of Maize Lethal Necrosis” workshop in Narok, Kenya, during 30 June-3 July 2013. This was not the case a few weeks ago when Tende, who is also a senior research officer at KARI-Katumani, received leaf samples from a farmer for maize lethal necrosis (MLN) verification.